Discover the magical world of Robert Stanek's Bugville Critters! Stanek, acclaimed author of the popular children's books The Kingdoms and the Elves of the Reaches and Journey Beyond the Beyond, has selected an irresistible combination for this age group: loveable critters and baseball. The Bugville Critters stories address all the major issues of growing up and are designed to appeal to the ever-growing interests of children three to eight years old. The stories combine facts about our natural world with fictional stories that instruct and entertain. Robert Stanek wrote The Bugville Critters books as bedtime stories for his children. His children enjoyed the stories so much they urged him to bring his stories to life for other children to enjoy, and that is what he set out to do. This production, great for younger listeners, includes three Stanek favorites: Go on Vacation, Rush to the Hospital, and Play Their First Big Game. In the first, Buster Bee and his family go on vacation to Long Lake. Buster is unsure about going away from home but learns to adjust. He meets a friend named Dag, and the two have fun at the lake. In the second, Buster and his family return from vacation. Buster learns the value of doing what he is told. After all the hard work, Buster's mom has a special surprise for him, but there's an even bigger surprise waiting for Buster at Bugville General Hospital. In the third, Buster Bee and his friends Barry Beetle, Lass Ladybug, and Cat Caterpillar practice for and then play in the Little Bug League Tournament of Champions. Along the way, Buster learns the importance of family and the importance of being a helpful big little brother. What are you waiting for? Join us on a journey to Bugville where you'll meet Buster Bee and all his friends. The younger kids love listening to the Bugville Critters stories. These are heart-warming fun stories about loveable critters. It's something kids can turn to when they need some encouragement. It's an awesome gift and it's a book that should be in every library, young and old. These are very fun stories and perfect for young toddlers and older kids alike. Every time we listen, my four and six year olds say, "Again, again, again!" A joy to listen to! My children and I love the delightful critters at the center of Robert Stanek's bugville stories. These are wondeful bedtime or anytime listens. This was just narrated to darn slow for my child (and myself), and the narrator wasn't engaging. The voices she used weren't very different from each other either. Someone that wants a very slow and almost monotonous narrative might enjoy this one. What was most disappointing about Robert Stanek’s story? It isn't the story, I haven't gotten through the whole story because I just couldn't sit through the narration. Her voice/voices weren't engaging and she was painfully slow. I even sped-up the playback,but it just wasn't enough. 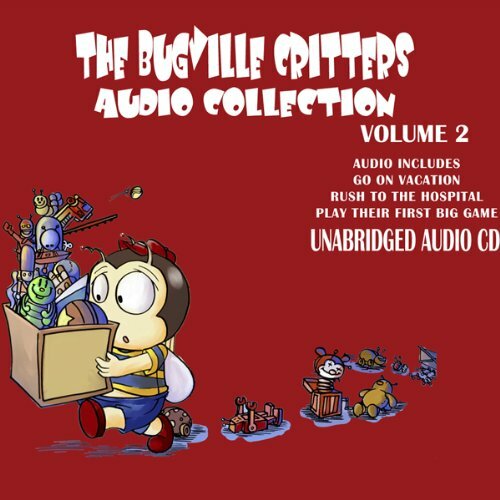 If you could play editor, what scene or scenes would you have cut from The Bugville Critters Audio Collection 2? None, I'd just have the narrative re-done by someone else, and if the narrator of choice couldn't do enough different voices for the characters, I'd think about bringing on a second narrator. Remember, this is a children's book and if you can't hold the child's attention then what good is it? These stories are as wonderful in audio as they are in print. My daughter loves these and listens each night.